Location is amazing. Housekeeping was also amazing and went above and beyond when my daughter was unexpectedly ill during the middle of the night. 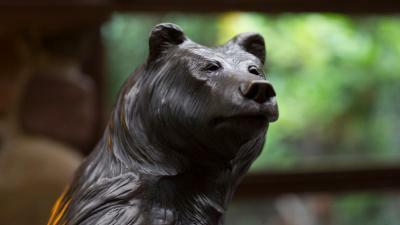 Good value for money, location was within easy reach, friendly staff. The location really close to the Disney parks and shops. 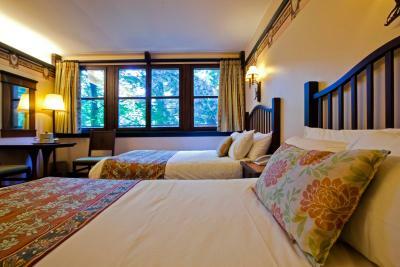 The room is clean, the beds are good and the area is calm and green. Disney TV available in different languages. Extra hour in the park before opening for the guests was great. Location to Disneyland was pretty good, and very clean. not much, the free afternoon tea and the concierge was good apart from that not much ! Staff very helpful and friendly. 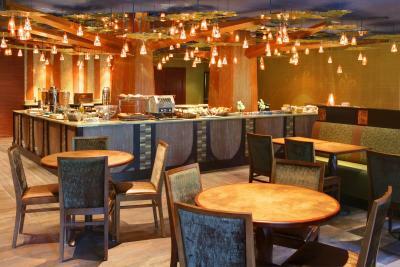 Lovely restaurant buffet. Had a lovely room view over the lake. Close to the park, clean, it makes you feel like part of Disney universe. And nice pillows! 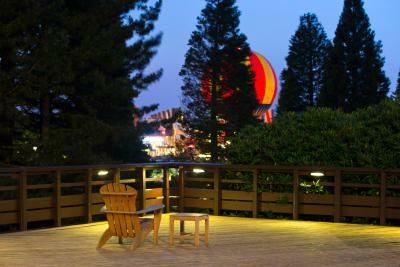 Location was great, short walk to Disney village and Disneyland parks. Loved the bambi and forest/lodge theme, and the attention to detail in decoration. Overall a lovely place to stay. Would stay again but will save more money next time to buy more treats! 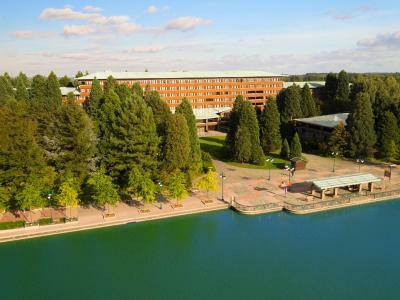 Disney's Sequoia Lodge® is a 14-minute walk from the Disney Parks and Marne-la-Vallée Chessy RER Train Station. 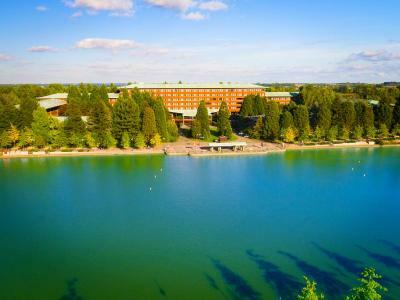 Free WiFi and free parking are available at this Bambi-themed hotel. 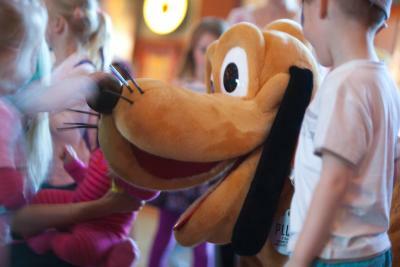 Guests can meet Disney characters in this hotel from 08:00 to 11:00 each morning. 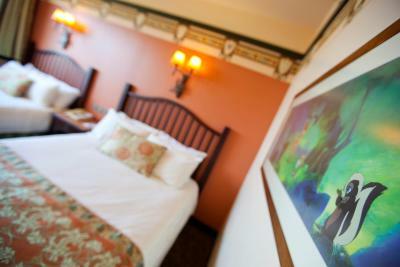 Rooms at the Disney Sequoia Lodge® feature air-conditioning and a flat-screen TV with Disney channels. They have a private bathroom with a bath, free toiletries and a hairdryer. An electric kettle is available upon request. 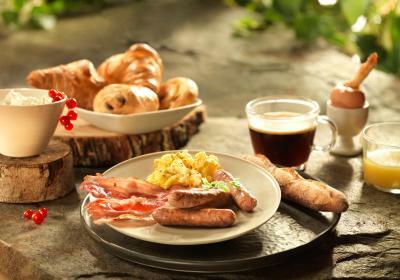 An American breakfast is available daily at an extra charge, subject to availability. 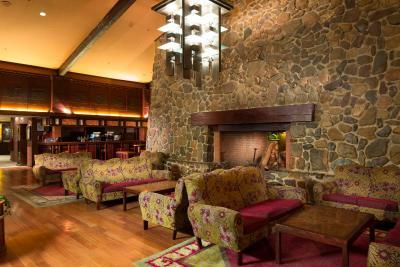 Guests can have dinner in one of the on-site restaurants or seat near the fireplace in the bar to enjoy a drink and snacks. Vending machines with snacks and soft drinks are also at guests’ disposal. 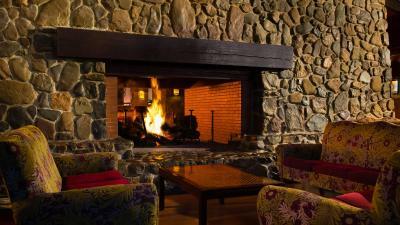 Guests can also access a fitness room, a sauna, a steam bath and a hammam. 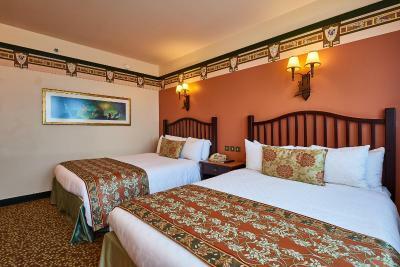 There is a 24-hour front desk, a luggage storage and a Disney shop on site. 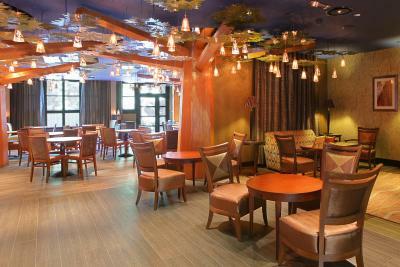 There is a hot beverage and ice machine which is available free of charge up to a limit of 4 drinks per room per day. The Magic Shuttle Bus takes guests to the nearby airports for a fee. 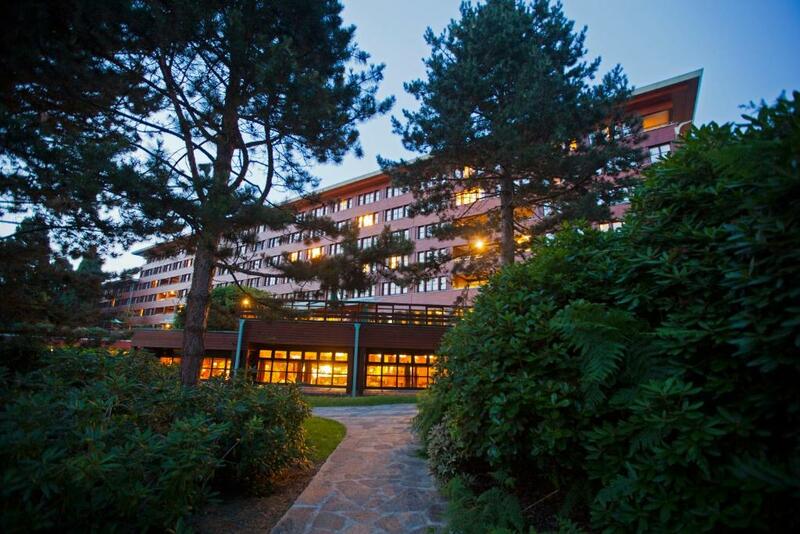 Golf Disneyland® is 1.9 mi away and Val d'Europe Shopping center is 1.2 mi from the hotel. Paris and Paris - Charles de Gaulle Airport are 25 mi from Disney's Sequoia Lodge®, while Versailles is 40 mi away. 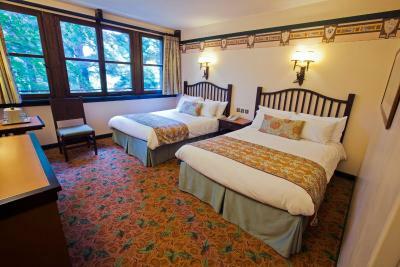 When would you like to stay at Disney's Sequoia Lodge®? 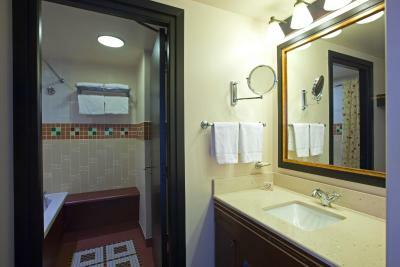 This air conditioned room features a flat-screen TV and a private bathroom with a bath, a hairdryer and free toiletries. 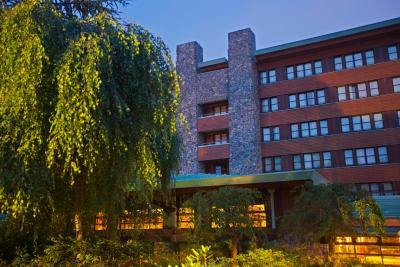 House Rules Disney's Sequoia Lodge® takes special requests – add in the next step! Please note that the swimming pools will be closed from 4 November 2018 until July 2019. Please note that the outdoor swimming pool is only heated during summer. 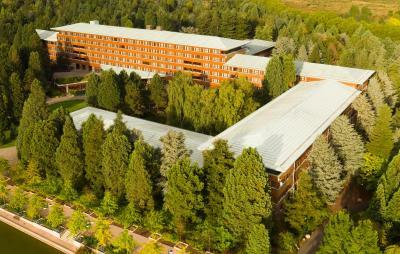 We in lodge a little away from main hotel, would have prefered main building but it was not clear when booking. 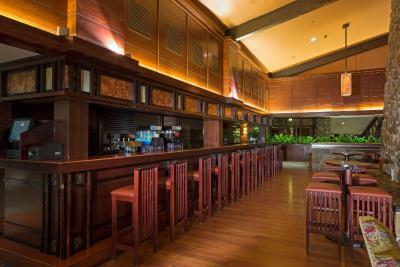 Bar was nice, it was in main building. 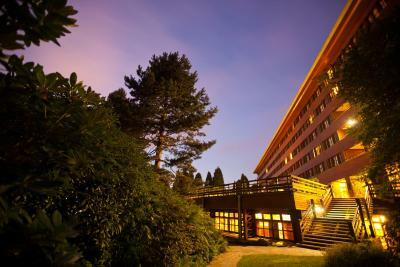 Ridiculously overpriced esp as booking.com advertised it as 805 then payment page for it jumped to 850 for 4nights room only in a lodge so far away from the hotel we may as well have stayed at the Santa Fe. The room was also run down with broken fittings and only 2plug sockets in the room. 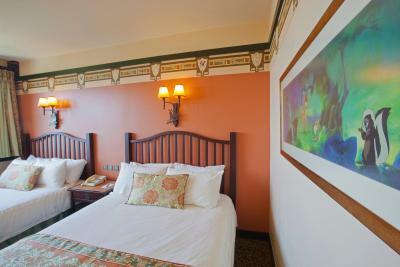 Save your money and stop at Santa Fe it's cleaner and staff are friendlier or better still the kyriad it's about 500 cheaper and a lot more pleasant! Really expensive - couldn't even touch the food for less than 30 Euro. Location and atmosphere were great. 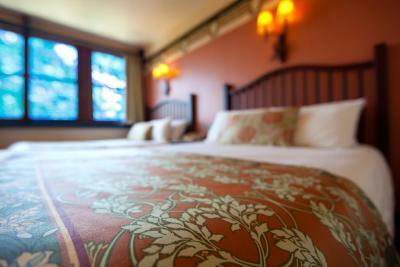 Rooms were small, beds were very uncomfortable, one was broken and tipping to the side, small towels, and no air flow. It was hot and we couldn’t open any windows! Room was a bit dated. Facilities are basic and dated. The leisure facilities were closed when we were there. Old rooms. The carpet needs a replacement. Hallway smells like my old grandmom’s house. Miss sold a room on line- standard room for adult and 3 children One bed!!!! Very dated, we stayed there 20 years ago when our children were small and it hasn’t changed at all!! 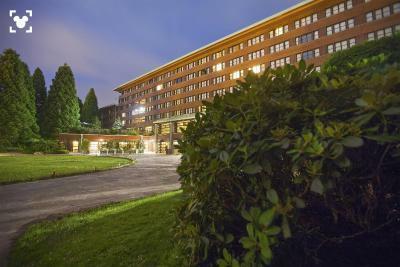 Great location for visiting the Parks!! Rooms just a little bit tired now and cleanliness could be improved.